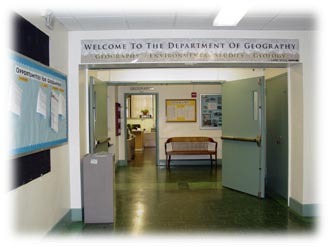 Founded in 1921, the Department of Geography is unique within the City University of New York (CUNY) and is the largest and one of the most technologically advanced geography programs in the region. Students can major in geography or environmental studies at the undergraduate level, and can continue on for an MA in Geography, a post-baccalaureate certificate in GIScience, and a PhD at the CUNY Graduate Center. Many of our students work in the public, private, and non-profit sectors in the New York Metropolitan Area. The department also runs field courses in Hawaii, Maine, Argentina, and the Catskills. (1) To educate students. To graduate from our program students who are able to conceptualize and analyze geographical and environmental issues and are confident with the theoretical approaches and analytical tools necessary to become active participants in addressing such issues. (2) To focus on our areas of strength. To advance knowledge and strengthen education in geographic information science, earth systems science, urban geography, globalization / international development, and environmental studies. (3) To lead diversification. To serve as a pioneering center in advancing the careers of women and minorities in geography and earth systems science. (4) To serve New York. To serve New York City's and New York State's needs for educated geographers, earth systems scientists, and geography / earth science teachers. To support the development of geographical databases and analytic tools to improve social, environmental, and economic well being for New York and its citizens.